Dimensions 1 by 8.50 by 10.75 in. About: Directed primarily toward undergraduate CIS/MIS college/university majors, this text also provides practical content to current and aspiring industry professionals. About: Management Information Systems provides comprehensive and integrative coverage of essential new technologies, information system applications, and their impact on business models and managerial decision-making in an exciting and interactive manner. About: Prepare for the real world of global business and information technology. About: For sophmore, junior, senior, and MBA-level MIS and Information Systems courses. About: Includes the entire text on CD-ROM, study guide-like bullet text for review, interactive exercises, glossary and links to the Laudon Website. About: The first MIS text that actually uses technology to teach students about information systems and technology. About: Information systems knowledge is essential for creating competitive firms, managing global corporations, and providing useful products and services to customers. 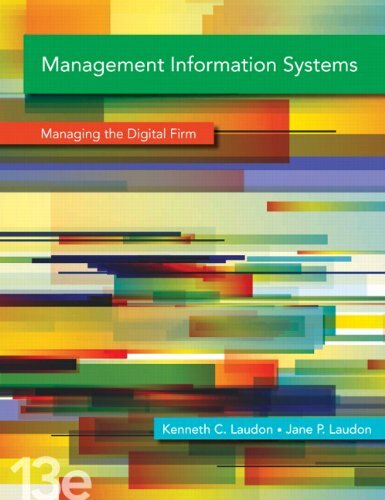 About: This text for undergraduate and MBA students introduces management information systems. About: Management Information Systems, Student Value Edition 11th Edition.